What Are Risk Factors for Primary Open-Angle Glaucoma? How Do Health-Care Professionals Diagnose and Assess Primary Open-Angle Glaucoma? What Is the Treatment for Primary Open-Angle Glaucoma? What Medications Treat Primary Open-Angle Glaucoma? When Is Laser Treatment Appropriate for Primary Open-Angle Glaucoma? What Are Surgical Treatment Options for Primary Open-Angle Glaucoma? Are There Home Remedies for Primary Open-Angle Glaucoma? What Is the Follow-up for Primary Open-Angle Glaucoma? Is It Possible to Prevent Primary Open-Angle Glaucoma? What Is the Prognosis for Primary Open-Angle Glaucoma? Primary open-angle glaucoma is one of the leading preventable causes of blindness in the world, and it is the most common cause of blindness in African-Americans. Glaucoma is a condition that leads to optic nerve damage and possible irreversible visual loss. Progression of this optic nerve damage can usually be halted with treatment but cannot be reversed once the damage is done. There are several types of glaucoma, and primary open-angle glaucoma (POAG) is the most common. In POAG, there are characteristic optic nerve changes (damage) associated with open angles (the area between the iris and cornea) and elevated eye pressure. This is in contrast to other types of glaucoma, which are associated with abnormal angles (for example, narrow-angle glaucoma, closed-angle glaucoma, primary congenital glaucoma, and other secondary glaucomas) or low eye pressures (normal tension glaucoma). What all types of glaucoma have in common is a pattern of progressive optic nerve damage that eventually may lead to irreversible vision loss if not found and treated in time. In many forms, there are no symptoms at all during the initial stages. For this reason, screening for glaucoma is very important. The exact cause of primary open-angle glaucoma is unknown. Certain genes have been identified that are associated with glaucoma, and more research is under way to study these genetic factors. Identification of any family history of glaucoma is therefore helpful. Elevated intraocular pressure (high IOP): Average eye pressures range from 10-21 mm Hg. The higher the pressure, the higher the risk of developing glaucoma. However, not all people with a pressure in the 20s will go on to develop glaucoma, and conversely, there are people with pressures at the low end of the range who can have rapidly progressive glaucoma. Age: Glaucoma becomes more common as we age. Race: People of African descent get glaucoma more frequently and at a younger age than Caucasians. Family history is important as some cases of glaucoma are hereditary. Corneal thickness: Thin corneas are associated with a higher risk for glaucoma. Corneal thickness is measured by the eye doctor using specialized instruments. Possibly more important than the thickness of the cornea is the stiffness of the cornea, with less stiff (more pliable) corneas being associated with higher glaucoma risk. Instruments to measure the corneal stiffness are being developed and may in the future be used for routine screening. Myopia (nearsightedness), diabetes mellitus, and hypertension are also often associated with glaucoma. In the early or mild stage of primary open-angle glaucoma, there are no symptoms. Because of the silent nature of primary open-angle glaucoma, people do not usually have any visual complaints until late in the course of the disease. By the time one would notice vision loss or blind spots, the late or severe stage of glaucoma may have been reached and significant amounts of irreversible optic nerve damage may have already occurred. Again, this is why screening for the disease early on is so important. The earlier the diagnosis is made, the better the odds of successful treatment. There are no outward signs of primary open-angle glaucoma. The main signs are the presence of a thinned (atrophied) optic nerve and the presence of an open angle, both of which can be seen using specialized instruments during an eye examination. Regular eye examinations with an eye doctor (optometrist or ophthalmologist) are important to screen for primary open-angle glaucoma, particularly for people who are at high risk for glaucoma, such as African-Americans, elderly individuals, and those with a family history of glaucoma. Eye pain or redness, halos in the vision and headaches are not typically associated with primary open-angle glaucoma but may be associated with other types of glaucoma. Smoking history: Smoking generally exacerbates optic nerve damage in most forms of glaucoma. Eye pressure: Tonometry is the measurement of intraocular pressure (IOP). Some instruments test pressure using a puff of air. Other instruments such as contact tonometers are typically used after instilling a numbing drop on the eye. Examination of the front part of the eye: A slit lamp is an upright microscope used by eye doctors to examine the parts of the eye that can be affected by glaucoma, including the cornea, anterior chamber, iris, and lens. 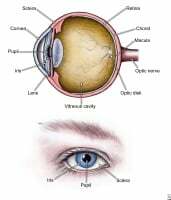 Examination of the optic nerve (fundoscopy): Using either an ophthalmoscope or the slit lamp microscope and a lens, the examiner can look through the pupil and see the portion of the optic nerve that is inside the eye and the layers of nerve fibers as they spread out over the retina in the eye (the nerve fiber layer). The examiner is looking for signs of optic neuropathy, or thinning (atrophy) of the nerve tissue. Often the pupils need to be dilated for an adequate view. The optic nerve head is referred to as the disc; within the disc, there is a concave area, which is referred to as the "cup." The larger the cup in relation to the disc (for example, the larger the cup-to-disc ratio), the higher the likelihood of glaucoma. The nerve can be viewed using a direct ophthalmoscope, although the 3-D view at the slit lamp or the indirect ophthalmoscope gives a better assessment of the cupping. The examiner will also look for other signs that are characteristic of glaucomatous optic neuropathy (for example, certain patterns of nerve rim thinning, presence of hemorrhage at the disc edge, certain blood vessel patterns, atrophy of the tissue surrounding the nerve, and asymmetry between the two eyes' nerves). A baseline photograph of the optic disc (fundus photography) may be taken for future reference. Pachymetry (or corneal thickness) is measured with ultrasound. A thinner cornea is associated with higher risk of glaucoma. Gonioscopy allows the examiner to view the angle of your eye. This is the area between the peripheral iris and cornea where circulating fluid within the eye (aqueous) drains back into the bloodstream through a sieve-like structure called the trabecular meshwork. A gonioscopic lens is a special contact lens with mirrors that permits the examiner to determine if the angles are open (as is the case in primary open-angle glaucoma) or narrowed, closed, scarred, or damaged (as seen in other forms of glaucoma). The anatomy of the angle can also be visualized using ultrasound or OCT (optical coherence tomography). Neuroimaging: If the eye doctor is concerned that the appearance of the optic nerve suggests possible glaucoma, a nerve fiber analysis (NFA) can be done with OCT (optical coherence tomography). This measures the topography and thickness of the nerve tissue and is especially useful in determining which regions of the nerve appear most thinned. Thinning of the nerve tissue is one of the earliest signs of glaucoma. Sequential exams can be compared so any progressive thinning over time can be detected. The optic disc can also be studied using confocal scanning laser ophthalmoscopy and the ganglion cells (nerve fiber layer) can be studied using scanning laser polarimetry. All of these instruments offer the advantage of objective measurements that can be repeated over time for comparison. Visual field testing: Glaucomatous vision loss can be detected using visual field testing. Often the earliest vision loss is a slight reduction of the peripheral (side) vision. Reading an eye chart would not detect these subtle changes. The visual field test not only detects subtle areas of dimmed vision, it also maps the size and area of the dim vision. If the visual field defect shows a pattern that is characteristic of glaucomatous vision loss, and if the area of the visual field defect correlates with the area of the nerve that was observed to be thinned, this would indicate that glaucoma is likely present. Visual field defects can also be a result of other eye diseases (for example, macular degeneration, retinal vascular occlusions, and other optic nerve disorders) and have to be distinguished from glaucomatous field defects. As with NFA, sequential testing is done so any worsening of the visual field defect over time can be detected. If a visual field defect seems to progress in a manner that is uncharacteristic of glaucoma, then your ophthalmologist will perform additional tests to look for other causes of vision loss. The central goal of treatment for primary open-angle glaucoma is preventing or minimizing damage to the optic nerve. Once glaucoma is diagnosed, current treatment involves attempting to lower the eye pressure. This is true whether the baseline eye pressure started out on the high end of the typical range or on the low end. Initially, the goal is to lower the baseline pressure by about 25%. Follow-up examinations of the optic nerve and visual fields are performed. If the nerve and fields are stable, then the treatment is considered adequate. However, if optic nerve thinning and visual field defects continue to worsen, a new target is set at an even lower eye pressure. The goal is to get the pressure low enough that the disease stabilizes. There are three main ways to lower the eye pressure: medication, laser, and surgery. There are several classes of eyedrops that can effectively lower eye pressure. A fluid in the eye called aqueous is constantly being produced in the eye by the ciliary body (a tissue located behind the iris) and draining back into the bloodstream via the angle. Medicated eyedrops work by altering the dynamics of this aqueous flow. Some types of medications work by decreasing the rate of production of the aqueous (alpha-adrenergic agonists, beta-adrenergic blockers, and carbonic anhydrase inhibitors). Others work by easing the outflow of aqueous fluid (prostaglandin analogs and miotic agents). Some drops come in combinations, such as a beta-blocker combined with a carbonic anhydrase inhibitor. It is important to note that all glaucoma medications have side effects. Some of these medications' side effects can be serious in the presence of certain medical conditions. For example, beta-blockers should be avoided by asthmatics, and those with slow heart rates and carbonic anhydrase inhibitors are contraindicated in those with sulfa allergies. Your doctor will review your medical history to determine which drops are safest for you. Side effects of all drops can be minimized by proper eye-drop placement. It is a good idea to keep the eyes closed for a full minute after placing the drop, and your doctor can teach you a punctal occlusion technique (applying gentle pressure to the side of the bridge of the nose, where the nasolacrimal duct is located) to minimize the amount of eyedrop that can be absorbed into the bloodstream. In some cases, more than one medication is needed to lower the pressure adequately. To maximize the effectiveness of the drops, ideally one should wait five minutes after placement of the first drop before placing another drop. Once medical treatment is begun, follow-up visits are important to recheck eye pressures and determine if the pressure goals have been met. Keep in mind that the drops may need to be taken indefinitely. Also, drops are for prevention of permanent vision loss, not reversal of any already existing glaucomatous vision loss. If you are experiencing any side effects or allergic symptoms (redness, itching) while on a drug, be sure to tell your eye doctor. If the pressure cannot be effectively lowered with medication, laser treatment by an ophthalmologist may be suggested. Laser is applied to the drainage channels (the trabecular meshwork) in the angle. Some patients get a very good lowering of the eye pressure with one treatment, others require two treatments, and others get only a minimum or temporary response. As with eyedrop treatment, close follow-up is important to continue monitoring the eye pressures over time. Medications in the form of eyedrops will probably need to be continued, even after successful laser treatment of open-angle glaucoma. The two types of laser treatment currently used most often are SLT (selective laser trabeculoplasty) and ALT (argon laser trabeculoplasty). If medicine and/or laser therapy have failed to adequately control intraocular pressure, an ophthalmologist can offer surgical options, as well. Cataract surgery: Recent studies have found that following cataract removal many patients have a lowering of eye pressure that may last for several months or more, possibly because aqueous has less resistance to outflow following surgery. For this reason, patients who have cataracts might want to consider surgery sooner rather than later. MIGS (micro-invasive glaucoma surgery): This is a newer category of treatments in which either a small implantable device is placed in the angle to assist in aqueous outflow, or an instrument is inserted into the eye through a small incision and used to mechanically widen or open the drainage channels in the angle (for example, viscocanalostomy and suture canaloplasty). Studies are under way to determine the long-term efficacy of these treatments. Trabeculectomy: This surgery entails creating an alternate pathway for the aqueous outflow that bypasses the trabecular meshwork. The ophthalmic surgeon constructs a new drainage channel from the peripheral iris to a space under the conjunctiva (a bleb). The aqueous under the bleb then gets reabsorbed back into the bloodstream. As with any eye surgery, close follow-up is necessary to monitor any complications, as well as to determine if the pressure goal is achieved. Drainage implant surgery: As with a trabeculectomy, drainage implant surgery allows the aqueous to exit the eye via an alternate pathway that bypasses the trabecular meshwork. The ophthalmologist implants a device (such as a Molteno valve or an Ahmed valve) that has a tube in the anterior chamber at one end and a valved chamber under the conjunctiva at the other end. The aqueous humor exits into the subconjunctival space where it is then absorbed back into the bloodstream, thereby lowering intraocular pressure. Again, as with any eye surgery, close follow-up is necessary to monitor for complications, as well as to determine if the pressure goal is achieved. Ciliary body ablation: Ciliary body ablation (also called cyclodestructive surgery) is a last resort and is reserved for those people with pressures that have not been lowered by medicine and other surgeries. In this procedure, the ophthalmologist uses a laser (diode laser) to destroy a portion of the ciliary body, thereby limiting the production of aqueous. Cryotherapy (freezing the ciliary body) has largely been replaced by ciliary body ablation by laser because the laser is better tolerated. There are no known home remedies for the treatment of glaucoma. If preservatives in eyedrop medications produce irritation, you can use preservative-free artificial tears as needed to soothe the eyes, however avoid using them within five to 10 minutes of instilling the medicated eyedrops to avoid inadvertently diluting the medication. Some medications are available in preservative-free formulations, too. Depending on the amount of optic nerve damage and the level of intraocular pressure control, some people with primary open-angle glaucoma may need frequent follow-up visits. A well-controlled glaucoma may only require two to three visits per year. Glaucoma should still be a concern in people who have elevated intraocular pressure with normal-looking optic nerves and normal visual field results. This is called ocular hypertension and carries an increased risk of eventually developing glaucoma. If one is diagnosed with ocular hypertension (high eye pressure with no signs of optic nerve damage), there is evidence that treatment to lower the eye pressure can prevent or at least delay the onset of glaucoma. In those who are diagnosed with glaucoma, prevention of irreversible vision loss is the goal of therapy. This is why routine screening to detect the disease early is so important. Treatment to lower the eye pressure adequately along with continued monitoring of the pressures and optic-nerve health are crucial for preventing vision loss. Poor cardiovascular health does not cause glaucoma, but it is associated with more severe vision loss in those with glaucoma. Therefore, maintaining healthy weight and blood sugar levels, controlling high blood pressure while at the same time avoiding blood pressure that is too low, and stopping smoking may help minimize vision loss. The prognosis is generally good for people with primary open-angle glaucoma. With follow-up care and compliance with medical treatment, most people with primary open-angle glaucoma retain useful vision throughout their lifetime. With poor control of intraocular pressure, permanent, irreversible vision loss may occur. "Understanding and Living with Glaucoma: A Reference Guide for People with Glaucoma and Their Families," Glaucoma Research Foundation, 1-800-826-6693. "Glaucoma Patient Resource: Living More Comfortably with Glaucoma," Prevent Blindness America, 1-800-331-2020. Elevated eye pressure is caused by a build-up of fluid inside the eye because the drainage channels (trabecular meshwork) cannot drain it properly. Elevated eye pressure can cause optic nerve damage and vision loss. 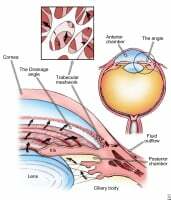 The two main types of glaucoma are open-angle glaucoma and angle-closure glaucoma. In angle-closure glaucoma, the normal drainage canals within the eye are physically blocked. Angle-closure glaucoma can be acute (sudden in onset) or chronic (lasting a long time), while open-angle glaucoma is usually chronic. In open-angle glaucoma, the drainage system itself is open but microscopic abnormalities within it prevent normal outflow of fluid. Both angle-closure glaucoma and open-angle glaucoma may cause optic nerve damage and vision loss with or without symptoms. Glaucoma is either primary (occurring without an underlying other cause or other eye disease) or secondary (related to other reasons, such as trauma, inflammation or medication). Pasquale, L.R., et al. "Prospective study of type 2 diabetes mellitus and risk of primary open-angle glaucoma in women." Ophthalmology 113.7 July 2006: 1081-6. Quigley, H.A., and A.T. Broman. "The number of people with glaucoma worldwide in 2010 and 2020." Br J Ophthalmol 90.3 March 2006: 262-7. Wise, L.A., et al. "A prospective study of diabetes, lifestyle factors, and glaucoma among African-American women." Ann Epidemiol 21.6 June 2011: 430-9. What were the symptoms you experienced from primary open-angle glaucoma? What treatment did you receive for your primary open-angle glaucoma? Did you undergo surgery for your primary open-angle glaucoma? Please tell us your experience and the results.